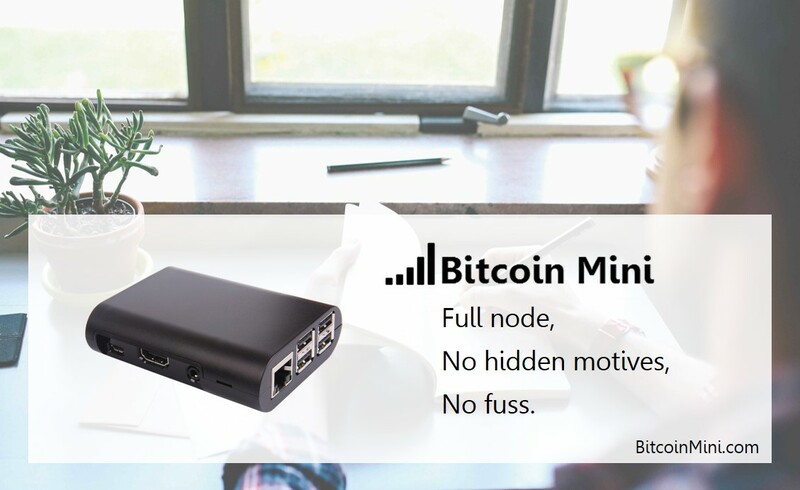 If you are looking for a plug and play full Bitcoin node solution you might want to check out the Bitcoin Mini solution that is powered by a Raspberry Pi 2 board with Arch Linux OS running a Bitcoin Core. The device comes with an 8 GB MicroSD card for the operating system plus 128 GB USB flash drive for storing the Bitcoin Blockchain. The 128 GB storage should be enough for quite some time considering that the size of the full Bitcoin blockchain data currently is getting close to 60 GB of data. The project offers two versions, the first one is a Mini Basic that is essentially a bare solution with just enough to plug in and have a full node running in your home with just basic command line functionality only for $139 USD. The second version is the regular Bitcoin Mini that comes with a custom Bitcoin API and webpage user interface that is available for $179 USD. You can also pay with Bitcoin which is to be expected from a project supporting crypto currencies taking into account the current exchange rate. The Bitcoin Mini is being shipped worldwide, but do note that shipping the product outside of USA is extra $25 USD.